True thymic hyperplasia is defined as increase in both size and weight of the gland while maintaining normal architecture. It may be 1) idiopathic (extremely rare), 2) may be seen as a rebound phenomenon during recovery from a stressful event such as steroid therapy or chemotherapy for malignant tumor and 3) in association with endocrine abnormalities, sarcoidosis, and Beckwith-Wiedeman syndrome. 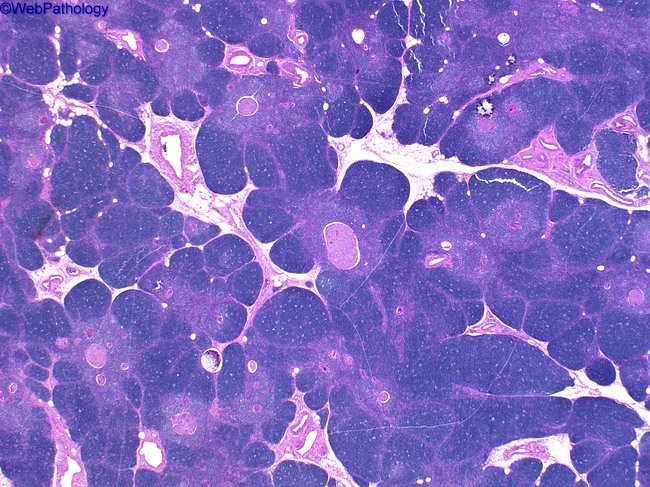 This image is a low power view of true thymic hyperplasia.